Both the kids got exited seeing cady. Soon the uninvited furious guest commanded cady to get some water. Cady being a teen got irritated to his authoritative nature. He took the glass tried to take of his anger on the damn glass. cady noticed it just thought he was a miser. He went to the book shelf in the living from where he can have a look of the couple in the room. He acted as if he is drinking water and seeing the collection. He is peeping into the room where he found priya handing over ram's shirt pleading him not to be naughty and ram made a puppy face. She is melting to his sulking face,he is cute than her kids pulled his cheeks and Planted a feathery kiss on his nose. It was a separate peace he found on her face which was missing since she met him leaving ram. It seems like she got her life back. She is different. "Rajath uncle" "rajath uncle" kids voice echoed in his ears. This act of rajath did not went unobserved,ram saw what was rajath doing. He noticed stress on rajaths face. Ram wanted to see what will he do. Kids went away from rajath to cady. Ram pulled priya back she landed in his arms. he pinned her to wall and kissed her neck sucking her skin. Ram is observing rajath's change of behavior. Finally rajath banged the glass on the floor. With the loud notice ram and priya rushed to the living area acting calm rajath said sorry. Ram came to a conclusion that their intimacy is effecting rajth . but Y?. Priya came to clean the mess so that it do not hurt any of her loved ones. While picking the broken pieces one peirced to her finger. Rajath saw this as a reflexed action he took her finger plunged the broken piece from her finger when was about to keep her finger in his mouth. Ram hold his hand and same time priya reverted her hand back. Ram did the necessary first aid with a gharelu chitka [ kept her finger in his mouth and cleaned the wound. he took her inside to bandage her wound. "Rajath my brother help .. plz pick up all broken glass and trash it." Ram asked.
" yeah ... sure.. BROTHER" rajath said disheartedly. Rajath is cleaning the mess. Kady is nursing kids. Priya felt rajath's behavior strange. Ram even had no clue of his behavior. But so many questions were taunting him. he made up his mind the he has to find out. He saw to her eyes which were confused and was aimlessly staring. He jerked her both shared a pale smile. He kissed her forehead and hugged her from side. Priya could not forget ram called rajath brother. she recalled the conversation with rajath introducing ram. One big question is that if he knows ram then how does he do not know his wife. The same question taunted ram he tightened his grip on her shoulder. She could not resist any more, she do not want her happiness to be spoiled. Rajath's behaviour is odd. She rejected his offer to drop her to college. She wanted to drop her kids along with ram and ram drop her in college. Kids pulled rajath to their car. Ram made kids sit in the back seat. He came to the passenger seat to open the door for his wife, she blushed. Ram came close to her kissed her cheeks, and heaved a sigh. He did want a day alone with her but duty calls. Rajath did not leave yet but he was observing the love birds through the rare view mirror. They both hardheartedly sat and drove towards the play school. Ram instructed the kids to wait for him. both the kids are delighted to introduce their papa to friends. Priya was a little late in all this. Ram and priya walked together in to the college. Ram has to stop in the corridor to meet students who came to speak to him. as soon as she entered rajath shouted at her for being irresponsible and late. It was the first time he did behaved so. Ram entered the room saw priya's blood shot teary eyes. She excused herself and walked away. Later ram said sorry to rajath on behalf of priya. Ram asked rajath the details of mall's business. In the talks ram wanted to test rajath's response and said priya will not work here. Will go back to Bombay. Rajath was furious again. Gritting his teeth tighter he manged to speak yeah that good idea and confirmed if priya said yes or no. Ram confidently said she wont say no to him ever. "yeah ..! so probably it might be the reason she patch up quick though u were faulted" rajath said. Ram was sucessful in his plan. Ram nevver shared anything in his personal life but how come he came to know lot?. Rajath suggested ram to do mall's business here. So that they can stay here. Ram expressed his intrest in it. Both walked to priya's cabin. Ram's eye fell on her name plate sharma is written, rajath took a marker and stricken sharma and wrote KAPUR. 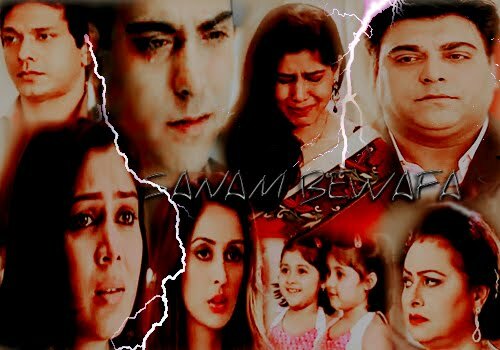 Priya and ram became angry. She could not tolerate it and kept the name plate in trash bin. " you were mistaken sir.might be u were used to write kapur with U' am Mrs priya ram kapoor not priya sharma or just priya kapoor. Any ways i have to get a new name plate hope the management will arrange for it" Ram felt proud for her reaction. She frowned at him and walked away. He smiled and said .. "hitler .. my hellcat" rajath heard it..
" nothing.. priya bhi na.. dont ever do this .. she is ur bhabhi remember.. or else get ready to face worst of her.. brother.. if i dont be there in 5 min that's the end ..bye see you in the mall after in the evening" ram rushed out. "raam..." ram saw her aim less stare at a distance he recognised the car..
"kiss me ... now" she said ... oops did she said so! Ram is surprised and smiled. "damn cant u hear! kiss me... am ur wife damn it.. common now" ram was surprised to see her demanding kiss he pecked her cheek. "yup but we are in a public place are you sure u r ok with this ..in our car...!!." she stared at him. She is so determined and ram had no way than to capture her lips . He could savour her to eternity but realizing the inconvenience to public had a breif kiss. she saw the car barged into the roads with high speed, it can expected to harm someone. She captured the person to be rajath. This made her doubt real. Ram dropped her back. He signaled priya. Her face became suspicious and fearfull. Ram crossed his arm around her shoulder in assurance that he wil sort out things. She dint want to spoil her moment with her love. "it was a delicious lunch after a long time"
?" he spoke pointing about their romance since morning.
" You... who is this i was talking to? Ram kapoor right... who knows the tycoons romantic side better than me. After all we do had lot of crazy memories ... i can never forget that day i gave my virginity in the arms of nature to u.. remember the beach" she said naughtly. "yeah... wish i could get those days back with.. Hmmm!" he blushed.
" I just love you so much... i saw my Darling is coming back.." he said to himself and drove the car towards the mall to solve many puzzel remembering their past. The most sweetest time spend with her. It is a peace to her eyes to see the person in front of her. She could recognized the image through the blurred image she sensed cause of tears. She was in a fear of loosing him . her insecurities rise awake along with the morning. She rushed to his arms and hugged him tight. Did not even cared to find the surroundings. Unknowingly the reason he called her, tried to control her she did not respond. So he tried soothing her rubbing on her back after a while he felt wetness on his vest. It correctly stricked him, Insecurity . he thought . Oh my pretty evil... he has to clear it at least now on a temporary means. He smiled feeling proud of her love on him. "i woke up and i did not found u ! and u know me. I am .. am ... Am scared in there with out u.. i felt u ... i mean u left me.. ram i cannot live without u ram" she hugged him back. He laughed . which made her angry and she hit him on his arm. He could not agree to what he heard. He tried to joke to lighten the moment.
" hmmm... i dont think u will free me that easy". He walked back guessing what is coming head his way. She started hitting him for his comments. She ran after him to hit him forgetting that happened , after a few min ,he stopped her pulled her to his embrace saying " i will never ever leave you even in my worst nightmare. I love you more than my life.. I will only love u"
"I love u ... but... what about jackie"